Trusted by over 30,000 people! Great for Home Owners, Renters, HOAs, Realtors, Real Estate, Private Sellers, Schools, Businesses, Parties, Construction & More! 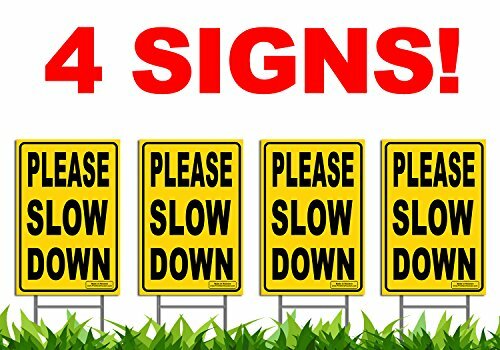 The 12"x 18" black & yellow Please Slow Down signs will ensure that drivers will see your sign even at night time. We also provide a very wide yard stake (10" length) which helps to keep the sign standing through more severe weather conditions. Size: 12 inches length x 0.16 inches width x 18 inches height. Made in the USA! Material: 4mm Corrugated Plastic Sign; Short Vertical Flutes; No Tools Needed! If you have any questions about this product by Signs'R Us, contact us by completing and submitting the form below. If you are looking for a specif part number, please include it with your message.